03 May 2017, ADDIS ABABA – The European Union (EU) has given €3 million in humanitarian funds to support UNICEF’s emergency interventions in Ethiopia. The new grant will provide life-saving nutrition treatment for severely malnourished children living in drought-affected areas of the country. In Ethiopia, below-average rainfall has worsened the situation in Somali, Afar, and parts of Oromia and Southern Nations, Nationalities, and People’s (SNNP) regions, already severely affected by protracted drought. Access to water, sanitation and health services in these areas is critically low. In addition, livestock deaths have further reduced communities’ capacity to cope, resulting in food and nutrition insecurity. An estimated 303,000 children under the age of five are at risk of severe acute malnutrition (SAM) in 2017. The EU humanitarian funding will support UNICEF to reduce child mortality and morbidity associated with SAM. In order to reach vulnerable children in remote areas, UNICEF will support the Government to expand existing healthcare services and provide treatment supplies – including ready-to-use-therapeutic food (RUTF), therapeutic milk, and medicines. The intervention will also aim at mobilizing communities’ awareness on preventing malnutrition. The concerted efforts of UNICEF with the EU, the Government of Ethiopia and other partners, will relieve the suffering of children while continuing to build long term resilience and strengthening the Government’s capacity to respond to future nutrition emergencies. 06 April 2017, ADDIS ABABA – The Government of Japan announced a US$2 million grant to UNICEF to assist water supply, sanitation and hygiene (WASH), nutrition and prevention of acute watery diarrhoea in drought affected populations in the Somali region. The WASH sector will be taking the lion’s share with US$1,500,000 and the rest US$500,000 will be utilized by nutrition programme within an implementation period of six months. This assistance is provided as a swift response to the joint call for support by Deputy Prime Minister Mr Demeke Mekonnen and United Nations Secretary-General Mr Antonio Guterres at UNECA on 29 January 2017 on the occasion of the High Level Forum on the humanitarian situation in Ethiopia. The funding from the Japan Government aims to improve access to safe and reliable water to 115,000 women, men, boys and girls through drilling of new boreholes, rehabilitating non-functional water points and providing non-food items for distribution. In addition, 9,000 children with severe acute malnutrition will receive adequate treatment and 31,488 mothers and caregivers will be trained on adequate infant and young child feeding practices during emergency. The funding will also help prevent and control water-borne diseases, particularly the transmission of acute watery diarrhoea among affected and at-risk populations by securing access to safe water. Adding to an already dire situation, during the second half of 2016, a strong negative impact of Indian Ocean Dipole (IOD) led to below-average rainfall in different parts of Ethiopia including the Somali region. As a result, the water level declined significantly with seasonal rivers, springs and ponds drying up earlier than normal and increasing frequency of non-functionality of water supply schemes due to over utilization. UNICEF is currently involved in operations across all the drought affected regions and contributes to the ongoing drought response effort through water trucking, rehabilitation of non-functional water supply schemes, building water storage capacity at critical and good yielding boreholes, provision of therapeutic food supplies, screening of children and pregnant and lactating women for malnutrition and monitoring for the provision of quality nutrition services. UNICEF’s drought response activities are guided by its Core Commitments for Children in Humanitarian Action, which prioritize timely response in key lifesaving sectors, namely nutrition, health, water, sanitation, and hygiene. GASHAMO, SOMALI, 15 February 2017 – Under the shade of a tree and settled on plastic mats, the mobile health and nutrition team (MHNT) is in full operation. An array of bright coloured fabric represents the crowd of mothers and children gathered around them, all in varying stages of screening, vaccinations, treatment or referral. In the rural Somali region, Gashamo woreda (district), 63 km off the paved road, the MHNT has been operating as a static clinic for the past two months as part of the response to the Horn of Africa drought caused by the negative Indian Ocean Dipole (IOD). Facing food and grazing shortages and in need of water, drought-affected pastoralist families and their livestock began traveling long distances in search of water. As one of the most vulnerable communities across the country, unique interventions are required to provide them a safety net in times of emergency. The Government of Ethiopia (GoE) has provided a swift response by setting up five temporary sites in Gashamo woreda, which offer health and nutrition services as well as food and water. This arrangement is crucial and specific to pastoralist communities, where families are scattered across hundreds of kilometres of harsh semi-arid desert. 28-year-old Mohammed, a senior clinical nurse by training, works alongside two nurses who treat and manage cases, in addition to two health extension workers (HEWs) who screen patients and conduct community health education. Mohammed and his team were assigned to this hotspot priority one site by the Somali Regional Health Bureau (RHB), following a recent updating of hotspot woredas, which are most affected by malnutrition according to the latest meher seasonal assessment. “My family is 200 km away and I am not sure when I will visit them. Probably when the drought is over,” says Mohammed. “But our work here is very important, there are thousands of people who otherwise would not have access to any health services. 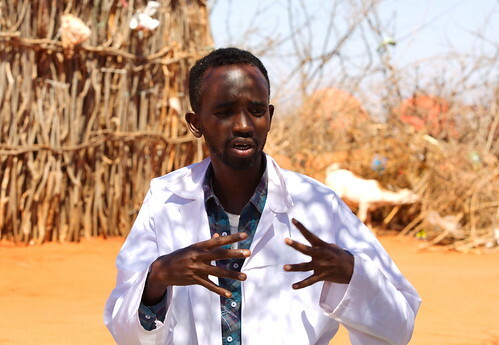 Especially during a severe drought, our services save lives.” He explains further that while the Ethiopian health system is highly developed, utilizing catchment areas for a tiered health facility structure is not feasible in pastoralist communities. This is the reason MHNTs were created and why they have helped improve the health and nutrition situation of pastoralist families for the past decade. From regular risk assessments and categorization of vulnerable woredas by the Ministry of Health and partners, including UNICEF, MHNTs are deployed for a minimum of three months, depending on the emergency situation and needs. With the onset of a sudden disease outbreaks or other emergencies, the MHNT will temporary relocate to the affected area to provide initial rapid response and then return to their assigned woreda. The MHNTs work six days per week, traveling from location to location and setting up mobile clinics along the way. They make contacts with social mobilisers, volunteers from the community, to ensure everyone knows the day and place where the MHNT will be. The social mobilisers know their community well, even those families that are spread out across a vast terrain, and they guarantee everyone receives the information. Every time, a crowd of mostly women and children are gathered, anticipating the needed treatment and care. 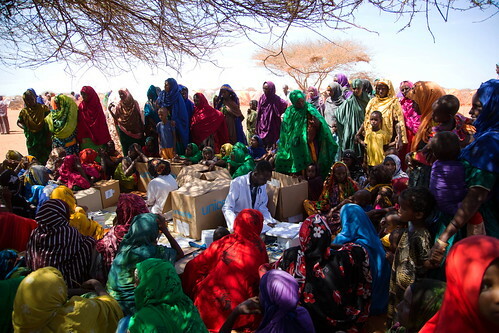 The MHNTs conduct screening for malnutrition, provide routine immunizations and basic healthcare treatment, ante-natal care and emergency delivery services, common illness management, health education and promotion, as well as refer patients to higher levels of care as and distributing household water purification supplies as necessary. When the latter happens, they often utilize their vehicles to bring patients to the nearest health facility, as it would be near impossible for timely care otherwise. UNICEF supports the GoE’s MHNT programme with the generous effort from donors, through vehicle provision, transportation allowances, emergency supplies and technical guidance. There are 49 MHNTs currently operating in Somali and Afar regions, moving around their respective regions according to the identified need. “The HEWs instructed us on how to feed her after she was discharged but we did not have the means to give her what she needed,” he says. Referring to himself as a poor farmer, he says the recent drought brought calamity on his household. “To begin with, I do not have much land and the corn I planted was destroyed by the flood and hail that came after the drought. So there was not much to eat at home,” he elaborates. The SNNPR is among the six regions in Ethiopia that have been particularly affected by the recent El Niño-caused drought and flooding, with 71 out of 137 woredas (districts) in the region classified as priority one woredas, requiring urgent humanitarian response. Consequently, UNICEF Ethiopia has continued its support to the Government of Ethiopia for the strengthening of Community-Based Management of Acute Malnutrition (CMAM), a programme that offers a package of services to tackle malnutrition. Through the provision of ready-to-use therapeutic food (RUTF) at health posts and therapeutic milks and essential drugs at the SCs, a high number of SAM cases are being treated in the region. Shebedino hospital, where Maritu is being treated, is among the 286 health centres and hospitals that have SCs for in-patient care in the region. According to Zerihun Asres, a stabilization nurse in the hospital, the number of SAM cases referred to them is declining, as the majority of cases are treated as outpatient at health centres and health posts. Tigist Angata is another parent grateful for the SAM treatment her firstborn son, Wondimu Wotei received. “I had almost given up because he was very small and I did not have enough milk to nurse him,” she recounts. At six months old, the HEWs in Telemo Kentise health post found in her kebele referred him to the SC in Shebedino hospital. He was only 3.5 kg at the time, approximately the size of a healthy newborn. Upon his return from the SC, he ate RUTF for a month and was discharged when he reached 4.4 kg. 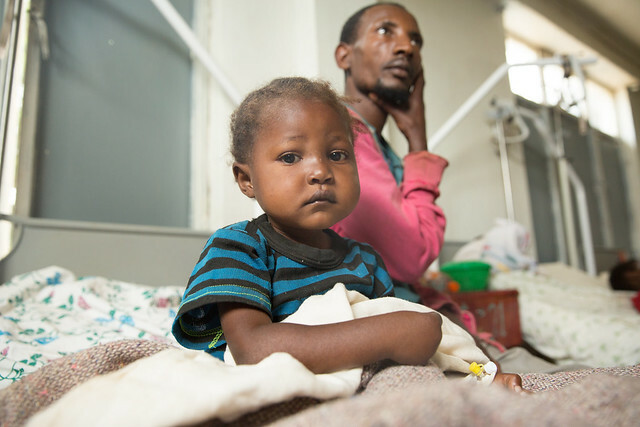 “He ate so well, which made me realize how much my son was deprived of food,” says Tigist. She adds that she is trying her best to prepare food for him at home, based on the lesson she received from the HEWs. However, eight-month-old Wondimu has not gained any weight since he was discharged from OTP. Her family’s livelihood is based on what her husband earns working on other farms. Due to the drought, he has not been able to work much since last year, which has caused a serious food shortage in their home. Though poverty seems to have a firm hold in her home, Tigist feels like the situation is better than what it used to be when her son was sick. “I was very distressed at the time because I was sick and he did not seem like he had much hope. But the therapeutic milk and food have brought him back to life and I am very happy and thankful for that,” she says. Her hope is for Wondimu to grow strong, become educated and find a better life than her and her husband’s. Through the contribution of many donors, including the European Commission’s humanitarian aid department (ECHO), UNICEF supported the Government in treating 272,165 SAM cases across the country from January to October 2016. Of those treated, 21,671 children were admitted for treatment in SCs while 250,494 received SAM treatment in the OTP. In SNNPR alone, CMAM services are available in all 106 woredas. 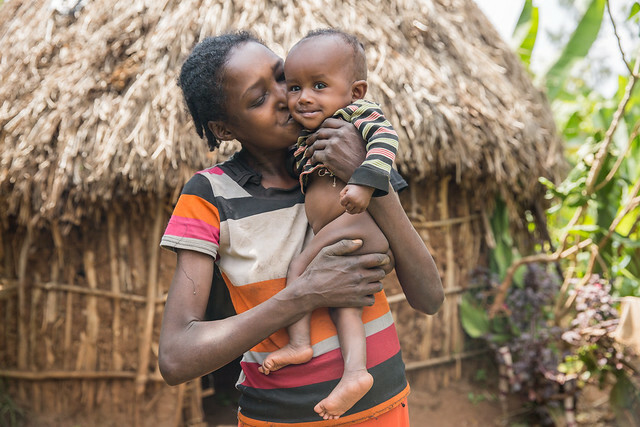 Last week, Ethiopia launched the second National Nutrition Programme (NNP) II focusing on the first 1,000 days of life to eradicate chronic malnutrition by 2030. 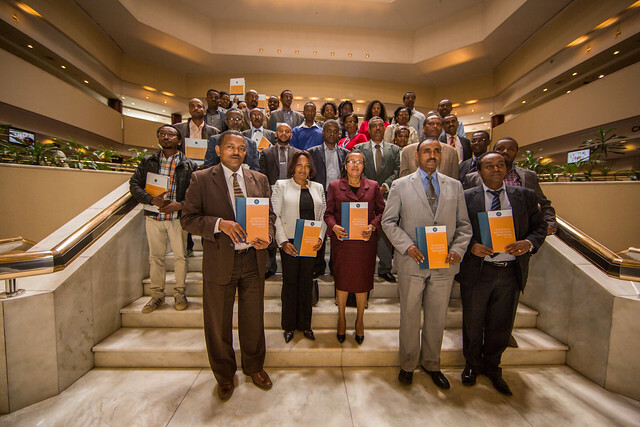 State Minister of Health and Chairperson of the National Nutrition Coordination Body (NNCB), Dr Kebede Worku, recognized 13 ministries that represent the Federal Democratic Republic of Ethiopia to support the achievement of the targets laid out in the National Nutrition Programme II. The ministries have recognised that high malnutrition rate in Ethiopia is unacceptable and have stressed the need for strengthened collaboration to reduce the impact of malnutrition in the country. The findings of ‘The Cost of Hunger in Africa,’ study revealed that Ethiopia loses 55.5 billion birr annually due malnutrition. 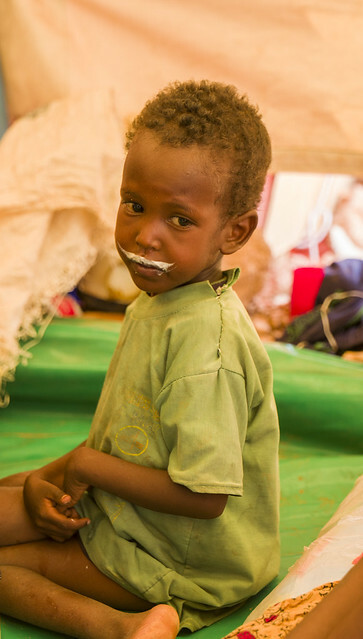 As malnutrition remains to be the underlying cause of more than one in five child deaths in Ethiopia, the goal of the NNP II is to provide a framework for coordinated and integrated implementation of multisector nutrition interventions. The NNP II is developed taking into account past experiences and lessons learned from the implementation of the NNP I and integrating new initiatives from the second Growth and Transformation Plan (GTP II). The updated aims of the NNP II include reducing the prevalence of three crucial indicators for children under five: stunting from 40 per cent to 26 per cent; underweight from 25 per cent to 13 per cent and wasting from 9 per cent to 4.9 per cent. With the following five strategic objectives, the NNP II envisions Ethiopia free of malnutrition and diet-related non-communicable diseases by 2050. 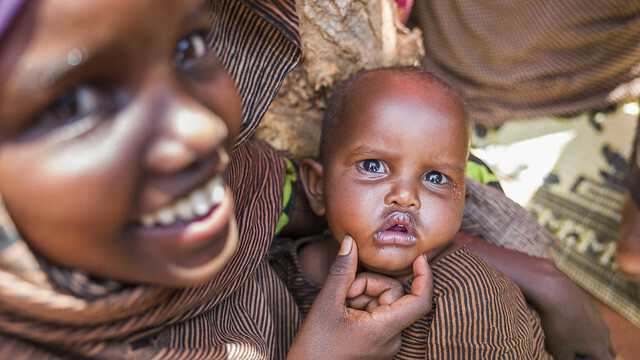 The Government of Ethiopia has demonstrated policy commitment to streamline nutrition efforts by incorporating indicators into the Government’s five-year Growth and Transformation Plan II (GTP II; 2016-20). UNICEF contributed to this important signing through technical support as a National Nutrition Technical Committee (NNTC) member and played a leading role in supporting the Government of Ethiopia to establish and nurture multisectoral coordination bodies at both federal and regional levels. 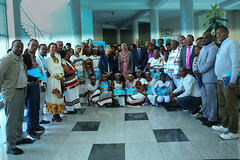 The event was attended by representatives from civil society organizations, academia, the Addis Ababa Chamber of Commerce, donors and UN agencies. NEW YORK/ ADDIS ABABA, 14 October 2016 – Five in six children under two years old are not fed enough nutritious food for their age, depriving them of the energy and nutrients they need at the most critical time in their physical and cognitive development, according to a new UNICEF report. Young children wait too long for their first bites. One in five babies hasn’t been fed any solid foods by the age of 11 months. Half of children aged six months to two years are not fed the minimum number of meals for their age, increasing their risk of stunting. Less than one-third of children in this age group eat a diverse diet – meaning from four or more food groups daily – causing deficiencies in vitamins and minerals. Almost half of pre-school aged children suffer from anaemia. Only half of children aged six to 11 months receive any foods from animal sources – including fish, meat, eggs and dairy – which are essential to supply zinc and iron. The high cost of foods from animal sources makes it difficult for the poorest families to improve their children’s diet. In Sub-Saharan Africa and South Asia, only one in six children from the poorest households aged six to 11 months eats a minimally diverse diet, compared to one in three from the richest households. Improving nutrition for young children could save 100,000 lives a year. Making nutritious foods affordable and accessible to the poorest children will require stronger and more targeted investments from governments and the private sector. Cash or in-kind transfers to vulnerable families; crop diversification programmes; and fortification of staple foods are key to improving nutrition for young children. Community-based health services that help caregivers learn better feeding practices, and safe water and sanitation – absolutely critical in preventing diarrhoea among children – are also vital. “We cannot afford to fail in our fight to improve nutrition for young children. 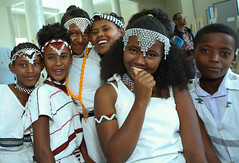 Their ability to grow, learn and contribute to their country’s future depends on it,” Begin said. 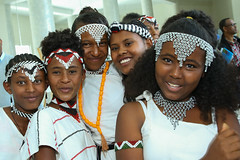 The Government of Ethiopia recognizes that addressing malnutrition is essential to achieving sustainable development. It therefore has issued the Seqota Declaration to end child malnutrition by 2030. The Declaration lays out a plan to stop the cycle of under-nutrition by bringing together all sectors of the Government, paying particular attention to the importance of nutrition during pregnancy and in the first years of a child’s life. These trends indicate an improvement in chronic malnutrition over the past 15 years. Yet, 28 per cent of child deaths in Ethiopia is associated with under-nutrition. In addition to this high contribution to the under-five mortality rate, high prevalence of various forms of malnutrition among vulnerable groups in Ethiopia has serious implications for social development and economic growth. In a study conducted in 2009, the total annual cost of under-nutrition was estimated at US$2,775,000, equivalent to 17 per cent of the country’s GDP in 2009. UNICEF’s strategies for nutrition ensure the achievements of results in four areas: 1) upstream nutrition policy support and multi-sectoral engagement; 2) improved nutrition knowledge and caring behaviours; 3) strengthening of systems for nutrition service delivery; and 4) strengthening partner capacities to respond to nutrition in humanitarian crises. To accelerate the reduction of chronic and acute malnutrition, UNICEF is working in partnership with sectoral government counterparts, including in health, agriculture, education, social protection, trade and industry, and women, children and youth affairs. UNICEF also works with United Nations agencies such as the Food and Agriculture Organization (FAO), United Nations Office for the Coordination of Humanitarian Affairs (UNOCHA), World Food Programme (WFP) and World Health Organization (WHO); UNICEF National Committees; donors such as the aid agencies of Canada, Ireland, Japan, the Netherlands, Spain, the United Kingdom and the United States, as well as the European Union; civil society organizations; and local and international academic institutions. In June, The Government declared the failure of the spring Belg rains affecting smallholder famers and pastoralist. In October a Government –led multi-agency Meher assessment was conducted and concluded that the expected harvest was far below expectation due to poor and erratic rains as a result to El Niño. This led to the increase in the number of priority 1 woredas from 142 in August to 186 and the estimated number of people in need of food assistance rose to 10.2 million with and an estimated 400,000 children with severe acute malnutrition. In response to this, UNICEF has been supporting the Government in scaling up its response to the emergency by increase the number of health facilities capable of treating severe acute malnutrition, at present 14,788 facilities now fully equipped to treat severe acute malnutrition with supplies such as Ready to Use supplementary food and essential medicines. 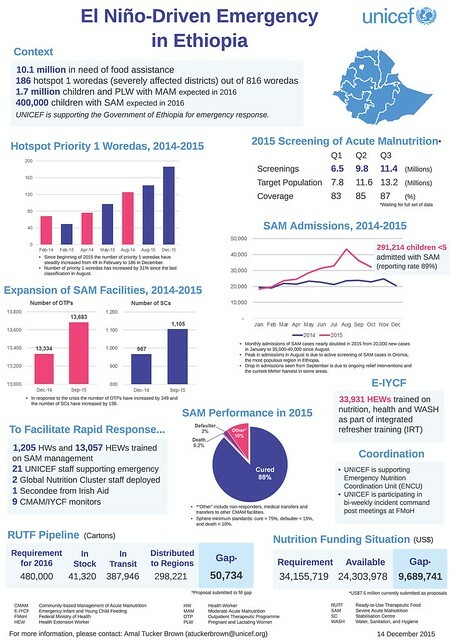 Currently 291,214 cases of severe acute malnutrition have already been treated with monthly admissions nearly doubling since then beginning of the year from 20,000 new cases in January to 35,000 -40,000 new admission since August-October. See below infographics for more.